Michigan Birth Injury Lawyers | Doctors insist on vaginal birth when mother has C-section scars (VBAC) & twin pregnancy, which causes uterine rupture & brain damage / cerebral palsy in the baby. A mother with a known high-risk twin pregnancy went into labor before her pregnancy reached 6 months. Her high-risk obstetrician had recommended a C-section delivery for multiple reasons, including the fact that her two previous deliveries had been C-sections and she was currently pregnant with twins. However, when the young mother arrived at Richmond University Medical Center in Staten Island, the obstetricians proceeded with a vaginal delivery instead of the recommended C-section. The mother’s uterus ruptured. She and the twins lost an extremely large amount of blood, resulting in devastating consequences for the mother and her babies. The infants developed severe brain damage and cerebral palsy. The young woman’s family members told reporters that the 30 year-old mother was hemorrhaging during labor and delivery, lost a lot of blood and went into cardiac arrest. The family is outraged because the medical team knew the pregnant woman could not deliver vaginally. The physicians kept telling her to push, even though she said she couldn’t. The award-winning birth injury lawyers at Reiter & Walsh ABC Law Centers have helped hundreds of children affected by hypoxic ischemic encephalopathy and cerebral palsy. Michigan attorney Jesse Reiter, president of ABC Law Centers, has been focusing solely on birth injury cases for over 28 years, and most of his cases involve hypoxic ischemic encephalopathy (HIE) and cerebral palsy. Partners Jesse Reiter and Rebecca Walsh are currently recognized as two of the best medical malpractice lawyers in America by U.S. News and World Report 2015, which also recognized ABC Law Centers as one of the best medical malpractice law firms in the nation. The attorneys at ABC Law Centers have won numerous awards for their advocacy of children and are members of the Birth Trauma Litigation Group (BTLG) and the Michigan Association for Justice (MAJ). In fact, Jesse is one of only 2 attorneys in Michigan to have been elected Chair of the BTLG. If your child experienced a birth injury such as HIE, seizures, cerebral palsy or any other long-term condition, contact Reiter & Walsh today at 888-419-2229. 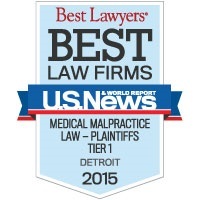 Our award-winning Michigan birth injury lawyers are available 24/7 to speak with you. The most serious risk associated with a vaginal delivery after a C-section (VBAC) is a ruptured uterus. The risk of a ruptured uterus occurring during a VBAC increases if the mother has had more than one prior C-section and if the mother is carrying multiple fetuses, which was the case with Victoria. Every medical procedure, including medication administration, requires informed consent, which means the physician must thoroughly explain the risks, benefits and alternatives of each procedure. Of course, informed consent requires that the physician explain the specific risks the individual patient faces. In addition to the fact that Victoria had 2 previous C-sections and a twin pregnancy, her primary obstetrician recommended a C-section. This recommendation also should have been a factor in the informed consent conversation and it weighs against the decision to perform a vaginal delivery. Indeed, a ruptured uterus (womb) is life-threatening for the mother and baby. A ruptured uterus is a complete tear through all layers of the uterus. It typically occurs when the forces and stresses of contractions associated with attempted vaginal delivery cause the uterus to tear open. If located near the placenta, a uterine tear can severely affect the flow of oxygen-rich blood being delivered to the baby. Regardless of the location of the tear, a uterine rupture can cause severe hemorrhaging in the mother, which can cause so much blood loss, that the flow of oxygen-rich blood to the baby is significantly decreased. This loss of blood can cause shock and cardiac arrest in the mother, which can lead to death in the mother and baby. If the baby survives, she can have permanent brain damage caused by a lack of oxygen to her brain (asphyxia). Brain injury caused by asphyxia is called hypoxic ischemic encephalopathy (HIE) and this can cause hypoxic-ischemic brain damage, cerebral palsy, seizure disorders, intellectual disabilities and developmental delays. A VBAC places a woman at risk of experiencing a ruptured uterus because the uterine scar from a C-section can tear open during labor. This can cause the baby to move outside of the uterus and into the mother’s abdomen. If the placenta becomes detached from the uterus, the baby will be completely cut off from her supply of oxygen. Prior C-sections, a scarred uterus, and a vaginal birth after caesarean (VBAC). Women with uterine scarring due to uterine surgeries or abdominal injuries are at increased risk of rupture. The use of Pitocin, Cytotec and other labor-induction drugs. Pitocin is a drug used to start labor and is one of the most common causes of uterine rupture. A recent study found that in one medical center, Pitocin had been administered in 77% of their uterine rupture cases. The chance of Pitocin-induced rupture increases with women who have had previous traumatic births. WHAT ARE THE SIGNS & SYMPTOMS OF A RUPTURED UTERUS? The classic signs of uterine rupture have been shown to be unreliable and frequently absent. Thus, non-reassuring fetal heart tones on the fetal heart monitor are the most common and often the only signs of uterine rupture. In most cases, signs of fetal distress will appear before pain or bleeding. It therefore is critical that physicians pay close attention to the fetal heart monitor and be prepared to perform an emergency C-section if indicated. When uterine rupture is present, a prompt delivery by emergency C-section delivery must occur in order to avoid cerebral palsy caused by hypoxic ischemic encephalopathy (HIE). WHAT MAKES A GOOD VBAC CANDIDATE? At least 18-24 months since the last C-section. A previous vaginal delivery either before or after the prior C-section. No additional uterine scars, problems or previous ruptures. The medical reason for the original C-section delivery is not repeated with the current pregnancy. No other major medical problems with the mother exist such as diabetes, obesity, high blood pressure or genital herpes. The baby is in the correct position and is not large. As with any delivery, the baby should be monitored very carefully. If there are signs of fetal distress, and interventions (e.g., amnio infusion, oxygen, etc.) aren’t successful – or the fetal distress is such that immediate delivery of the baby is required – a C-section must be performed as quickly as possible. Progesterone and cervical cerclage are the only medical treatments that have proven effective in significantly reducing the incidence of preterm birth. Progesterone is a hormone that can be given to the mother during pregnancy. The hormone has been shown to significantly reduce the risk of preterm birth in women who have a short cervix and women who have had a previous spontaneous preterm birth. A cervical cerclage procedure involves closing the cervix with a stitch or stiches to help reinforce the cervical muscle. This helps prevent preterm birth in women who have a short or incompetent cervix. Sudden onset preterm labor can also be halted in certain instances. If a mother goes into preterm labor, the physician can give her medication called a tocolytic to temporarily stop the contractions. This does not remove the condition that is causing the preterm labor, however, but it will delay delivery for about 48 hours so that steroids can be given to the mother to help the baby’s lungs (and other types of tissue) mature. Of course, if a mother is experiencing a uterine rupture, there must be no delay in delivering the baby or babies. Delivery by emergency C-section must take place within a matter of minutes. If your child has hypoxic ischemic encephalopathy (HIE), cerebral palsy or any other birth injury and you think it was caused by mismanagement of a twin pregnancy or ruptured uterus, the award-winning Michigan birth injury lawyers at Reiter & Walsh ABC Law Centers can help. The nationally recognized attorneys at Reiter & Walsh have been helping children with birth injuries throughout the nation for almost 3 decades. Jesse Reiter, the firm’s president, has been focusing on birth injury cases his entire 28+ year career. Jesse and his team help children all over the country, and when they take a case, they spend a lot of time getting to know the child and family they are helping so they can fully understand the child’s needs. Jesse and his partner Rebecca Walsh have won many awards for their advocacy of children, and they are currently recognized as two of the best medical malpractice lawyers in America by U.S. News and World Report 2015, which also recognized ABC Law Centers as one of the best law firms in the nation. Birth injury law is a difficult area of law to pursue due to the complex nature of the medical records. The birth injury lawyers at Reiter & Walsh ABC Law Centers have decades of experience with cerebral palsy cases. Our attorneys give personal attention to each child and family we help. We have numerous multi-million dollar verdicts and settlements that attest to our success, and no fees are ever paid to our firm until we win your case. Email or call us at 888-419-2229. Our firm’s Michigan birth injury lawyers are available 24 / 7 to speak with you.